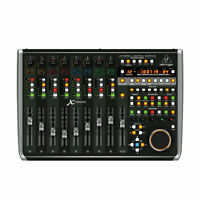 Details about Behringer X32 COMPACT Mixer Studio Digital Mixing Board NEW!! Behringer X32 COMPACT Mixer Studio Digital Mixing Board NEW!! Immediate payment of US $1,699.00 is required. Great compact console! Much smaller but with everything we need! 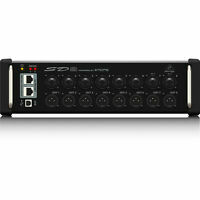 I previously used the Behringer X32, so going to the compact model was an easy transition. Will be traveling with this, so it's a great addition to our system. WAY less cables in tow, now that we are also using the digital snake. CAT5 cable is much easier to maneuver than an analog snake. Unlike the X32, this doesn't have 32 analog outputs (only 16), so if you need the analog outs, that's something to consider. Be sure your console has the latest firmware, which can be downloaded from the Behringer site. Fantastic board with great capabilities, all on a budget, but "compact" is a stretch. It seems Behringer is into reverse engineering in case you were unaware. The board has many features reminiscent of more expensive boards. It reminds me a lot of the Allen and Heath GLD-80. Although the Allen and Heath GLD-80 is probably a better board in this range in terms of sound and general quality (including being smaller and lighter), The x32c delivers almost every feature at less than half the price. I would also argue that the GLD-80 easier to use because of the touch screen, though iPad control of the x32 solves that issue. The interface is easy to learn and use and teach to unskilled users. I certainly do not regret buying this board over the Allen and Heath board because of the significant price differential. It was a great buy for our small church looking to purchase a board with expansion capabilities as we grow toward being a mid-size congregation. I have installed over 20 of these consoles in various venues from churches to nightclubs. 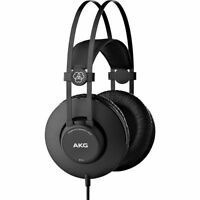 I own two of them and I feel this console blows all of the other ones away with its flexibility and it's audio quality. Admittedly the Midas version is a little bit more robust as far as switches and faders go but the same operating layout and functionality as the X-32. This is an amazingly versatile board. I use it for mixing instruments and vocals at a church and there is nothing this board cannot do for me. It is easy to get started and even easier to customize the channels inputs and output. The effects that come with the board save thousands of dollars on additional equipment. Nice job! The repackaging perfect. The console is of good quality. It looks brand new as the said. It was a little slow getting to me.